Mint Date : This issue does not have mint or dates marks. Size : 25.9 x 26.6 Weight : 3.32 grams. 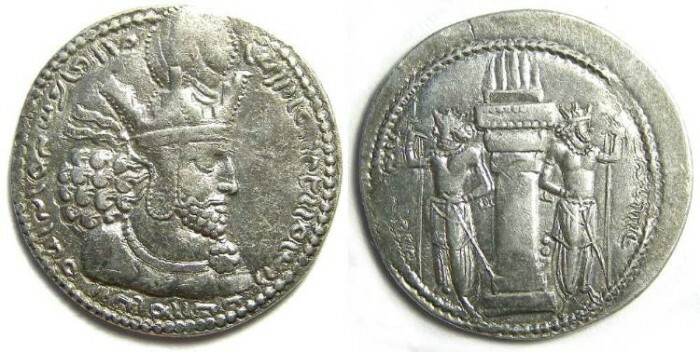 Obverse : Head of Shapur I right, with ear flaps on his headdress, with a long Sassanid inscription around. Reverse : Fire altar flanked by two attendants, with Sassanid inscriptions to the left and right which transliterates roughly to NURA ZI ShaHPURHRI (FIRE OF SHAPUR).